Ted Bundy (Zac Efron) is a handsome, intelligent, charismatic young man. When single mother Liz Kloepfer (Lily Collins) meets him in a Seattle bar, she can't resist his charms. For her, Ted is a match made in heaven, and she soon falls head over heels in love with the dashing young man. A picture of domestic bliss, the happy couple seems to have it all figured out until out of nowhere, their perfect life is shattered. Ted is arrested and charged with a series of increasingly grisly murders. Concern soon turns to paranoia and, as evidence piles up, Liz is forced to consider that the man with whom she shares her life could actually be a psychopath. 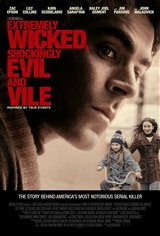 Based on the book The Phantom Prince: My Life with Ted Bundy, by Elizabeth Kendall.